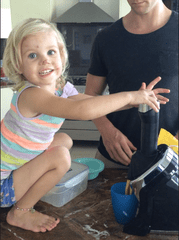 When we bought our thermomix, the thing that got us over the line with big J was the icecream. But it’s still a $2,000 machine. 2 grand to make icecream! It does so much more than that, but all Julius really cared about was the icecream. We’ve been enjoying soft serve, sorbet style healthy icecream ever since we bought the thermie way back when, and until recently we thought we were in the lucky top tier of kitchen appliance owners, I mean, la..dee…daah’ling, I’ll just whip it up in the thermie! That was until we started hearing about this thing with the hard to pronounce name. Yonanas. Save yourself the confusion, this is how it is meant to sound (and probably how the son of the inventor came up with the name). Now say “Yo” as in Bart Simpson. There you go. Yonanas. Definitely a name a kid came up with! You’ll recognise Annette because she is Annette Sym, from Symply too good to be true cookbook fame! Now about this machine – it’s a little quieter than a blender and a whole lot quieter than my thermie, which sounds like an aeroplane taking off. It takes about 1 minute to make icecream from frozen fruit. Bananas are about $1.50 a kilo at the moment, so we’ve bought heaps and frozen them for later. But in the meantime we’re using those cubes of frozen mango and berries you can get at Woolies or Coles for around $8 in the freezer section. Throw them down the chute and you get some cafe style sorbet out the bottom end, absolutely delish! So far we have made 3 of the 120 recipes that come with the elite model and we are planning on going through the whole lot. Insider secret – the best part? licking the icecream left in the machine when you clean it. YUM! Check out this video too (the official American yonanas video) – I laughed so hard when she said icecream on toaster waffles was a healthy treat for kids! *facepalm* it’s no wonder we have an obesity epidemic!